Our program allows children of all ages to enjoy many of the foods they love, with a healthy twist. Menus are planned to provide your children with the proper mix of vegetables, fruit, grains, meat and dairy. We publish specific nutritional criteria for all meals, making sure there are no additives or high fructose corn syrup. Our baked chicken nuggets, whole grains, and vegetable-filled sauces are kid favorites. Whenever possible, we incorporate fresh, organically-grown vegetables and herbs from our garden into creative dishes. Our Nutrition Analyst and Executive Chef continuously strive to bring innovative seasonal meals to the table. Partnership with parents is one of the most important aspects of our process. Encouraging healthy eating habits can be difficult at home and at school. In addition to providing the resources for your child’s healthy lunch, we also believe in educating them to make the right choices. Our sample school menus are available for inspiration. 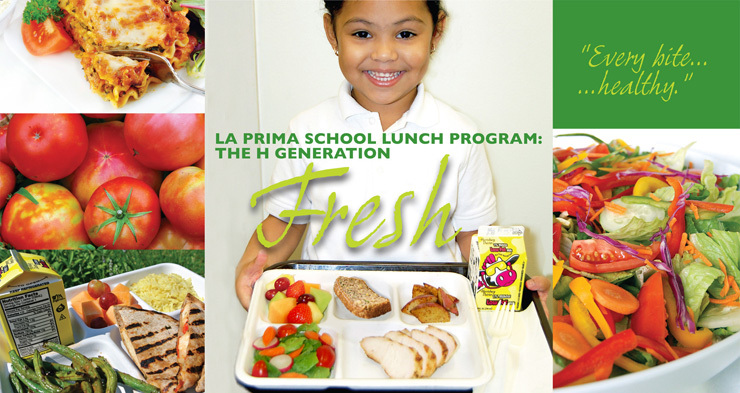 For more information on the Healthy Generation initiative, please email us at info@laprimacatering.com, or call us at 301.220.1001. Is your child getting the healthy school lunch they deserve? Ask your school today!